US, 2010, 117 minutes, Colour. Liam Neeson, Bradley Cooper, Jessica Biehl, Quinton ‘Rampage’ Jackson, Sharlto Copley, Patrick Wilson, Gerald Mc Raney, Henry Czerny. 1. Expectations, from the television series? Macho action? 2. The television series, the original stars, television icons? The new cast, the old identities? The action styles of the past? 21st century action styles? 3. The update, the background of Iraq, the 21st century? Plots? The US military, the CIA? Greed and dishonesty, clandestine operations, cover-ups? 4. The introduction to the team, establishing and re-establishing the characters? 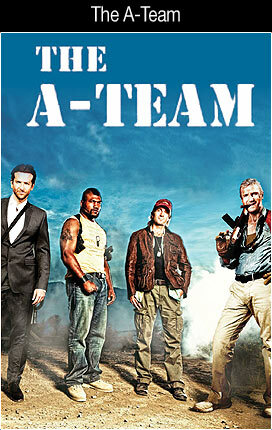 Hannibal Smith, the torture, the interrogation, Mexico, the rescue and escape? Face Man and his style, happy-go-lucky, the rescue? B.A. Baracus, driving the jeep, the pursuit, the introductions? Smith? Murdoch, mad, daredevil? The bonds between them, establishing the team? 5. The personalities, Smith as the tough leader, Face Man and his bravado and women, Baracus and his Mohawk style? Murdoch, flights, helicopters, explosives? 6. Time passing, the situation in Iraq? The transfer of the plates from the mint? The background of Saddam Hussein? Lynch, approaching the group, hiring them? Pyke and the rival group, his personality? General Morrison, friendship with Smith? Sosa and her relationship with Face Man, the break? Her suspicions? Orders? 7. The mission, the double-dealings, the explosives, the loss of the plates? 8. The arrest of the team, the court-martial, their internment in prisons, the different institutions, Murdoch and insanity? The glimpses of them? 9. Lynch, his background, the CIA, his associates and assistants? Retrying? Collusion? 10. Engineering the escapes from the prisons, the action sequences, techniques, reassembling the team? 11. Obtaining the intelligence, going to Europe? The plans, the locations? Face Man and his preparation of a plan? 12. The betrayal by Lynch, the pretence? Pyke and his involvement? Sosa and her involvement? 14. The boat, the discovery of General Morrison’s deceit, his death? The explosions? The timing of the arrival of the plates? Lynch and his team? Murdoch and his putting on the helmet, pretending to be the dead general? The risks? The tapes, Lynch caught on the tapes confessing? 15. Sosa, the phone calls, her participation in the plan? Her superior, Mc Cready? His wariness? The finale, the door going up – and Lynch being caught? 16. The CIA taking Lynch, and another Lynch appearing to take his place? 17. The achievement, clarifying their reputations, their good name – and readiness for any sequel?